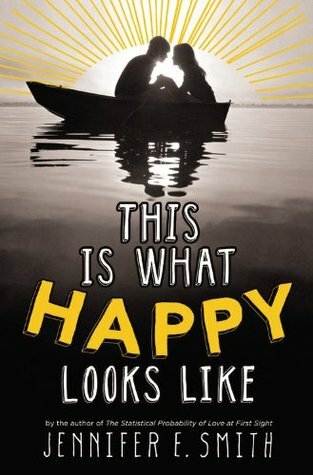 From Goodreads: When teenage movie star Graham Larkin accidentally sends small town girl Ellie O’Neill an email about his pet pig, the two seventeen-year-olds strike up a witty and unforgettable correspondence, discussing everything under the sun, except for their names or backgrounds. Then Graham finds out that Ellie’s Maine hometown is the perfect location for his latest film, and he decides to take their relationship from online to in-person. But can a star as famous as Graham really start a relationship with an ordinary girl like Ellie? And why does Ellie want to avoid the media’s spotlight at all costs? Characters – Graham and Ellie are so easy to relate to, and so easy to love. They’re genuine and authentic and layered. They’re kind to one another, and considerate of their friends and family. Graham and Ellie both have issues, but they’re not hung up on their troubles in a way that becomes tiresome. Romance – This one’s adorable, guys. Graham and Ellie are fantastic individually, but they make even more sense together. They have obvious chemistry, and their relationship is free of the contrived drama sometimes found in YA romance. The many challenges Graham and Ellie face on their journey to coupledom are formidable, but they feel real. Also, I like that this story doesn’t stretch out the “getting together” phase. There are plenty of sweet and steamy moments scattered throughout the narrative. Voice – Simply put, Jennifer E. Smith rocks the teen voice. Her books are a fantastic example of how contemporary YA should read. Email – Graham and Ellie meet online through a fluke email mix-up. Their on-going messages are sprinkled throughout the story, a device that could have taken a hard left into Cheeseville. Instead, the messages impart a quirky sense of fun, and a different way of getting to know the story’s main characters. Loved the emails! Fate – This is What Happy Looks Like lends the same warm-and-fuzzy tingles movies like You’ve Got Mail and Serendipity induce. There’s something so romantic and enviable about meant-to-be love. I think fate and real life meld perfectly in this book. So… What are you waiting for? Pick up This is What Happy Looks Like before this summer ends — you’ll be happy you did! I actually liked THIS IS WHAT HAPPY LOOKS LIKE better than STATISTICAL PROBABILITY (though, I really enjoyed that one too!). I love the cover as well, Rachel. It perfectly fits the tone of the story. Great review and rec, Katy! Oh, you know there’s plenty of contemporary YA that takes a hard left into Cheeseville, Jaime. That’s why I appreciate the amazing books that take one of those iffy concepts and totally rocks it. I’ve had a summer of pretty great reading myself — can’t complain about that! The ice cream parlor setting drew me into this one. I really liked this book too! Thanks, Erin! “Sometimes it’s nice to just read a sweet story about likable characters.” <— Yes! I'm finding myself drawn to these types of stories more and more lately. Of course… I hope you enjoy it! Warm fuzzies 🙂 I love that feeling when watching movies, when you just know it’s all going to work out. Think I’m gonna bump this one up near the top of my TBR-list. Thanks for the review, Katy. This happens to be what I’m reading right now. I haven’t read a contemporary in a while and this is proving to be a great way to jump back in. I’m about a third of the way through and Graham amd Ellie are just adorable. I hope you enjoy the story through to the end, Tanya. I thought it was incredibly well done, and yes, Graham and Ellie are too cute! Oh, I really liked this one, too. I love Jennifer E. Smith’s writing (in general) and that cover. Her books get great covers, don’t they? You’re spot-on with, “Graham and Ellie both have issues, but they’re not hung up on their troubles in a way that becomes tiresome.” I have a hard time with issue-y books and this one wasn’t one, but there’s a lot of depth of story and characters which is what makes it lovely. Great review! Her books have fantastic covers! I love their whimsy and bright, bold designs. And yes, Graham and Ellie were cute as can be, and totally endearing. I can’t wait to see what Jennifer E. Smith comes out with next!